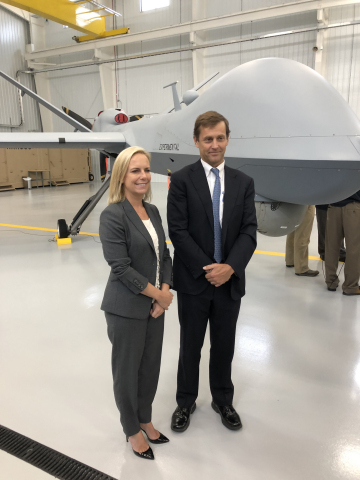 GRAND FORKS, N.D.--(BUSINESS WIRE)--General Atomics Aeronautical Systems, Inc. (GA-ASI) announced last week that it will be expanding its Flight Test and Training Center (FTTC) at the Grand Sky Unmanned Aircraft System (UAS) Business Park near Grand Forks, North Dakota. "We’re excited to expand our footprint at Grand Sky as part of our FTTC in Grand Forks," said Linden Blue, CEO, GA-ASI. "This growth from 5.5 acres to 20 acres will benefit our customers and strengthen our commitment to the Grand Forks community by building out our test and training capacity." GA-ASI announced last week that it will be expanding its Flight Test and Training Center at the Grand Sky UAS Business Park near Grand Forks, ND.